Graphene has extreme conductivity and is completely transparent while being inexpensive and nontoxic. This makes it a perfect candidate material for transparent contact layers for use in solar cells to conduct electricity without reducing the amount of incoming light – at least in theory. Whether or not this holds true in a real world setting is questionable as there is no such thing as “ideal” graphene – a free floating, flat honeycomb structure consisting of a single layer of carbon atoms: interactions with adjacent layers can change graphene’s properties dramatically. Now, Dr. Marc Gluba and Prof. Dr. Norbert Nickel of the HZB Institute for Silicon Photovoltaics have shown that graphene retains its impressive set of properties when it is coated with a thin silicon film. These findings have paved the way for entirely new possibilities to use in thin-film photovoltaics. To this end, they grew graphene on a thin copper sheet, next transferred it to a glass substrate, and finally coated it with a thin film of silicon. They examined two different versions that are commonly used in conventional silicon thin-film technologies: one sample contained an amorphous silicon layer, in which the silicon atoms are in a disordered state similar to a hardened molten glas; the other sample contained poly-crystalline silicon to help them observe the effects of a standard crystallization process on graphene’s properties. 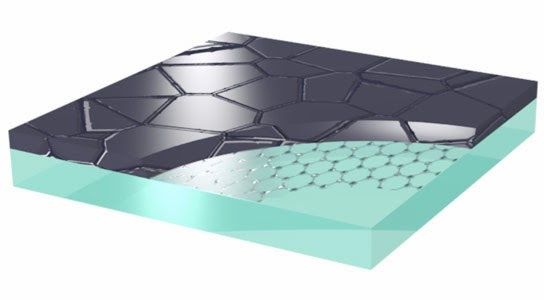 Even though the morphology of the top layer changed completely as a result of being heated to a temperature of several hundred degrees C, the graphene is still detectable. The researchers obtained their measurements on one square centimeter samples, although in practice it is feasible to coat much larger areas than that with graphene.